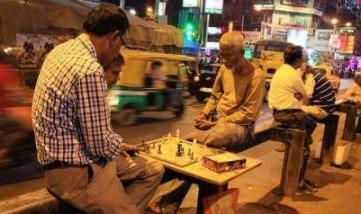 Calcutta’s under-the-bridge Chess Club flourishes! Calcutta: The Calcutta Police contribute to the face-lift of 30 year old under-the-flyover chess club that embodies Calcutta’s egalitarian spirit! The chess hangout that grew under the Gariahat flyover from humble pavement beginnings near Golpark in 1985 has attained the look of a legitimate club with 13 tables bearing laminated boards, arched lamp posts and 26 stools laid out for anyone who likes an endgame. Regulars at the Gariahat Chess Club range from government officials to hawkers, all with a shared love of the game and a capacity to concentrate in the all-day din around one of Calcutta’s busier intersections. The new arrangements have been made by Gariahat police station as part of a project with a budget of around Rs 20 lakh. “We could have gone for view-cutters but that would rob the club of its essence. It had to retain its character of being a place anybody can walk into,” an officer said. It is 7 pm on a sultry night in Calcutta. Clusters of men huddle over chess boards under the busy Gariahat flyover, oblivious to the traffic and noise around them. This is the Gariahat Chess Club where for a fee if INR 10 you can become a member and play some pretty intense rounds of chess. Playing games like carrom, ludo and chess on pavements is something very Calcutta — the Left governments had installed carrom boards in every nook and gully for one thing. This chess club was just an informal gathering of chess lovers in the area in the late 1980s, before the flyover was built. It took shape of a chess club in 2006 and is now called the Gariahat Chess Club. It has over 100 members — there are people who never miss a day’s play. It’s open to all. Also, Kolkata is one of the most egalitarian cities in the country — its public space are truly open to all. 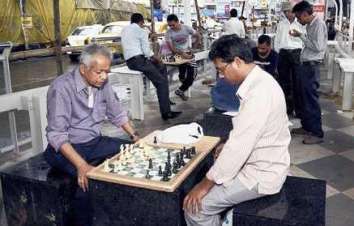 This chess club reflects that trait with people from all backgrounds coming together to play here — street dwellers, MPhil students, small traders, shopowners, retired professionals, school kids, middle class babus, in fact, many of the players are sons of hawkers who man the popular street stalls in the area. This spot is also popular as a general hangout joint — friends catching up on their way back from work, sipping tea, people singing or strumming a guitar, beggars and the homeless contemplating life, street kids playing. All this in one of the noisiest, most polluted junctions in the city! Future plans include arranging coaching for youngsters by some of the accomplished regulars. “We will put up a giant screen on one of the pillars of the flyover. We intend to invite top players to take special classes, which is when the screen will be required,” the officer said. The club had started out as an informal group of residents, shopkeepers and passers-by who would stop for a chess break. It wasn’t until 2006 that this daily assemblage of chess nerds metamorphosed into a registered club that “opens” around 3pm every day. Abhijit Saha, among the founding members of the club and currently the secretary, is delighted that its character hasn’t changed much from the time he and a few others had started playing on the pavement near Khadi Gram Udyog Bhavan near Golpark. When the Gariahat flyover was built, shifting there was an easy decision to make. “We had a free shade over our heads and so decided to shift. The number of members started growing and now we have around 120 regulars. There is also a floating population that just drops by to watch games and play if they get the chance,” Saha, who owns a stall on the Gariahat pavement, said. Priya Ranjan Das, a 65-year-old member, developed an interest in chess while studying English literature at Jadavpur University in the Seventies. Back when Gariahat Chess Club started, he and the rest of the group would sit on the iron railing with the board in between. “There used to be space for six to seven boards at best. We now have more than double that number and more players too,” he said. The “open and welcoming nature” of the club is something that officers at Gariahat police station intend to retain even as they plan to add features to this unique chess address.